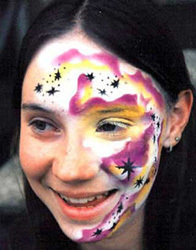 Our airbrush artist will create beautiful, detailed face painted designs using various stencils to create swirls and other patterns on your face, arm, or body. Extras like glitter add that special touch. 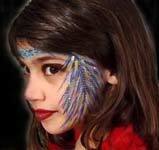 Great for mardis gras events, bar/bat mitzvahs, picnics and children's parties. These designs are breathtaking, eleborate and vibrantly colorful! We use only non-toxic and water based inks that may last for several days or are easily removed with soap and water. Choose simple or complex designs from glamorous to gothic, fantasy to horror styles. Requirements: 1 - 8 ft. table near electrical outlet.